Trunks (トランクス) is an important character in the Dragonball series, one of the bigger classic in manga and anime for boys. He’s the son of Vegeta. This profile is about a specific version of Trunks – as a grown-up coming from a possible future of the Dragonball world. Base Of Operations: Japan; Capsule Corp. Headquarters. 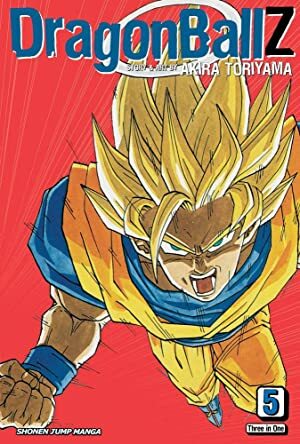 As a result of his Saiyan heritage, Trunks possesses superhuman strength and can easily lift (press) thousands of times his own weight directly overhead. 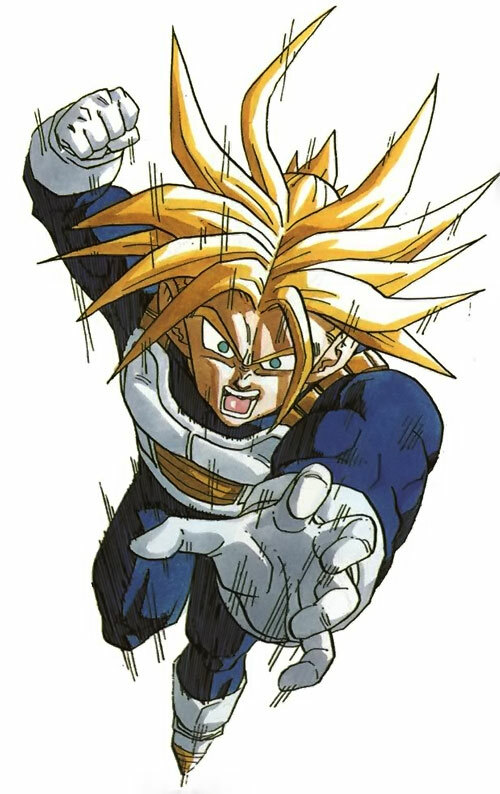 Trunks possesses the conventional physical attributes of the Saiyan race. He is superhumanly strong and fast, exceptionally agile, possesses copious amounts of endurance and resilience to harm, and the unusual capability of growing exponentially stronger after recovering from grievous injury. Through rigorous training and discipline, Trunks has pushed these traits to their absolute limits. He is therefore as strong, fast and durable as it is possible for a Saiyan warrior his age, weight and height to be. Like all members of his race, Trunks has a natural affinity for manipulating the vast amounts of chi that his body generates. The simplest application of this chi manipulation is to simply use this spiritual energy to reinforce his own natural abilities. Through a simple act of will, he can also release his spiritual energy from his body in controlled streams. This comes either as bursts of intense concussive force capable of reducing mountain tops to rubble or directly beneath himself in order to propel himself through the air at incredible speeds. Through training, Trunks has learned how achieve the “Super Saiyan” state. When operating at this level, Trunks’ internal reserve of chi is suddenly and explosively multiplied allowing him to temporarily increase his physical attributes and overall energy output by approximately 50 times. Through trial and error, Trunks has learned how to convert a portion of the energy generated by this highly volatile state into additional mass that he can add to his body, thereby increasing his physical strength to levels unmatched by any other Saiyan in existence. Trunks is a devastatingly effective melee fighter as a result of the formal training in the martial arts from both Son Gohan and Vegeta. Trunks’ martial arts training has granted him not only a mastery of his own chi, but also the ability to sense the potential and realized talent within others. With this ability, Trunks can accurately sense an individual’s fighting strength, ability and general alignment or motivation. Once he has gotten a “feel” of an individual’s chi, he can instantly recognize it again, and can even do so over vast distances. 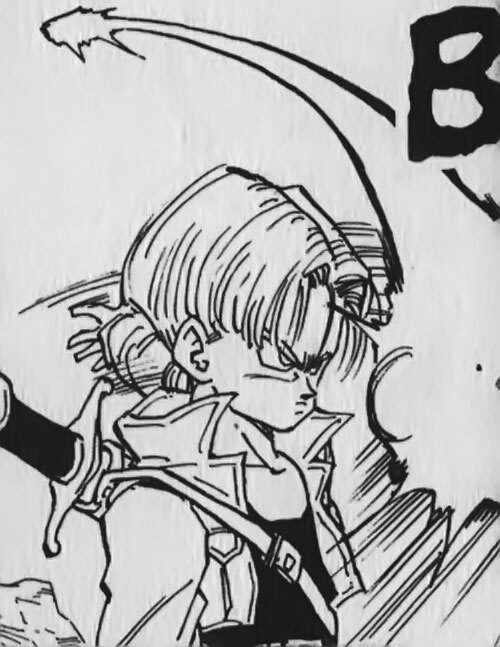 Trunks’ training has included the ability to mask his own chi, preventing others from sensing it unless he wishes them to. 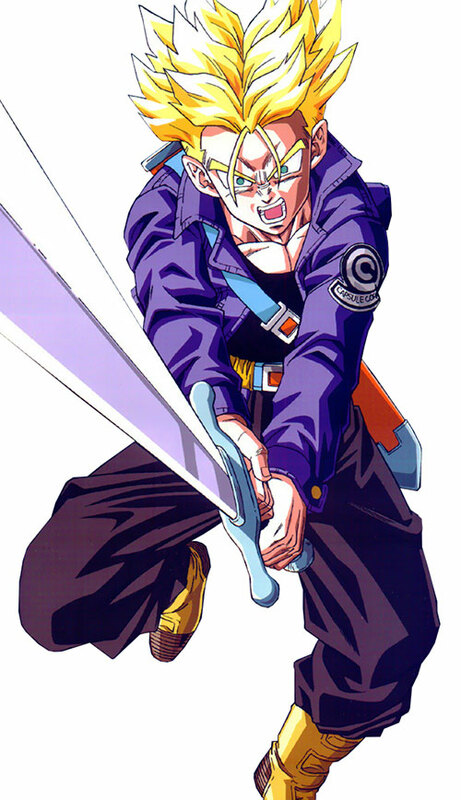 Trunks initially wielded a sword of unusual durability when he first arrived in the 20th century. The sword’s origins were never revealed, but it had a razor sharp edge and was strong enough to fend of blows from superhuman foes. Trunks wielded the sword until he shattered it against the seemingly indestructible form of Android 18. Here’s a video explainer if you don’t believe this is real. Trunks was born six years after Son Goku and his allies faced and defeated the tyrant Frieza on the doomed planet Namek. His parents were an unusual couple. His father was the Saiyan Prince, Vegeta; the former conqueror and literal murderer of worlds. His mother was the human Bulma, a rich heiress to the Capsule Corporation fortune and a genius inventor. The two came together under questionable circumstances, and their union produced Trunks, the third Saiyan-human hybrid. Two significant events took place during the year that surrounded Trunks’ birth. The first occurred a mere six months prior to his first day of life. It was at that time that the Earth’s greatest hero, Son Goku, succumbed to a deadly heart disease he had been infected with while he was exploring other worlds. The second occurred nearly a full year later. Trunks was barely a year old when his father, Vegeta, and the Earth’s remaining defenders were slaughtered by a pair of humanoid androids that were built by the insane Doctor Gero to murder Son Goku. Only Son Gohan survived the conflict, and that was because the other fighters refused to let him take part in the battle. With the fall of the “Z Fighters”, the androids laid waste to the remainder of the Earth’s defenses and cities. Their assault was as steady as it was inevitable, and slowly over the next 13 years, they reduced the human population to a mere fraction of what it had been before their creation. Son Gohan spent that time mentoring Trunks and teaching him the lessons he learned from his father, Son Goku and the great “demon” warrior Piccollo. 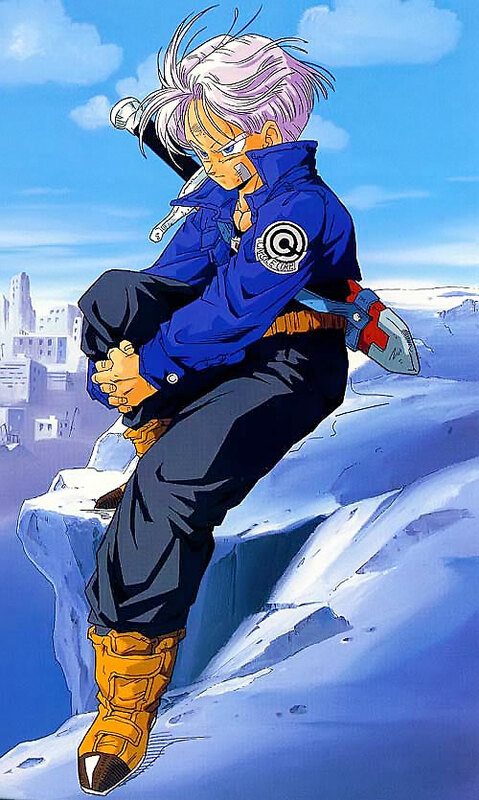 Trunks eagerly absorbed Gohan’s teachings and became a similarily devastating warrior despite his relative youth. Eventually the two young warriors decided it was time to face the murderous androids, and set out to confront them. Their first meeting was disastrous; the Androids’ power was simply too much for the two Saiyans. Though the two managed to flee the battle, it wasn’t before Son Gohan had lost one of his arms. The two eventually recovered from the fight. But they were drawn into combat with the Androids again when the Androids threatened to take innocent lives unless the Saiyans appeared. Gohan, realizing that this would be their final battle, rendered Trunks unconscious and went to face the Androids alone. Despite his best efforts, he was murdered by the killer robots. Trunks grieved for the only father he had ever known, and redoubled his training in the attempt to gain enough power to destroy the androids and gain a measure of revenge. Despite his training, and superhuman power, Trunks spent the next few years being continually defeated by the Android duo who had come to see their battles as a form of sport. It was at this point where Trunks mother, Bulma revealed the most important technological breakthrough of all time to her only son. Over the last dozen years, she had been feverishly working on a perplexing problem and she had finally overcome it. She had created a machine that could physically take an individual backwards in time. She had hoped to use the machine to go back in time and prevent Goku from succumbing to his disease and thus giving humanity an opportunity to defeat the androids. In the end though, she discovered that the past was immutable, and that each trip into the past created an alternate timeline than the one in which the time machine originated. However, she realized that there was still hope. If they managed to go back into the past and save that version of Goku, perhaps he could discern the androids’ weakness which they could use against the androids of the present. After explaining her theory to Trunks, the two decided that Trunks would be the better candidate for the trip. He was strong enough to defend himself should something unfortunate occur, and moreover he would finally get the chance to meet his father. With that, Trunks reluctantly agreed to leave his mother behind with the two murderous Androids in the hopes that he could somehow save his future. Trunks geared up for the voyage, bringing along his only real possession (his remarkable sword) and a vial of medication that would cure Son Goku of his heart disease. With a single wave and smile to his mother, he activated the Time Machine and in a flash of light and sound, instantly found himself 20 years in the past. As he disembarked from the now inert machine, Trunks felt a cold wave of malevolent chi as it descended on the Earth. He moved to investigate and realized that it was the villain Frieza and his father King Cold, who had just touched down upon the Earth’s surface. It was in that instant that Trunks realized the truth of what had happened. In his past, Son Goku had returned to the Earth before Frieza had arrived, but in this specific timeline, he hadn’t returned yet. Somehow, events were unfolding differently this time. Trunks only hesitated for a second, before he decided to intervene himself. He confronted Frieza and his father before they could do any damage and, after transforming into a Super Saiyan and, with an explosive display of power, slaughtered the two villains and their minions. Even as Trunks powered down, he sensed the arrival of several powerful sources of chi. He was unconcerned though as he recognized (and had expected) their source. With a confident smirk on his face, Trunks turned to face the “Z Fighters” who had arrived just in time to see him kill the evil aliens who had caused them all so much pain a few short years prior. Despite their multitude of questions, Trunks held his silence and waited patiently with the fighters for Goku’s arrival. The entire time he waited, he found himself openly staring at Vegeta; the father he never met. Vegeta bristled under Trunks attention but before the situation became violent, Goku came hurtling from the skies in his space craft. Trunks watched patiently while Goku greeted and got reacquainted his friends and allies, until Goku turned his attention to him. When Goku inquired as to who stopped Frieza, Trunks asked for a private audience with the returning hero. When the two moved out of earshot of the group, Trunks told Goku of the future that awaited them. He told him of his upcoming death, the horror of the Androids and the desolation that awaited the human race. To his surprise, Goku reacted with nothing more than disappointment at missing the big fight with the Androids. Impressed and heartened by Goku’s attitude, Trunks gave Goku the antidote to his disease and told him to take it at the first signs of cardiac distress. With that, he strolled back to his time machine and returned to the future. Trunks was forced to wait impatiently in the future while the time machine recharged. As soon as it had, he travelled back into the past once more to the approximate point in time when the androids first appeared. He arrived to find that Goku had once again fallen to the disease but lived still. Vegeta had become a Super Saiyan and destroyed one of the androids on his own… but to Trunk’s shock, the androids that had appeared were not the same ones that had ravaged his present. Trunks followed his father (who now knew who he was due to his actual birth in this timeline and Piccolo’s calling his name) to the android’s creator’s layer. Upon their arrival, he counselled the other fighters to strike without mercy before the androids could be activated. While the heroes debated over their next course of action, Android 20 (who was in truth Dr. Gero, the androids’ creator) activated Android 17 and 18… the very same androids that devastated Trunks future. By the time the fighters actually entered the layer, the enigmatic androids were awake and had murdered Dr. Gero in retaliation for deactivating them in the first place. Trunks, realizing that this was his best and only chance, unleashed a hellish salvo of energy directly into the layer before anyone could stop him in a desperate attempt to destroy the androids before they could start their rampage. Despite the ferocity of his sudden attack, the androids’ awesome speed allowed them to escape Dr. Gero’s layer (with yet another android in tow) before they could be harmed. The androids quickly grew bored with the allied heroes, and decided to leave in pursuit of their true target – Goku. Enraged at their apathy, Vegeta transformed into a Super Saiyan and attacked the android trio. Trunks in desperate fear for his father, pursued him and watched fretfully as the androids took Vegeta apart. 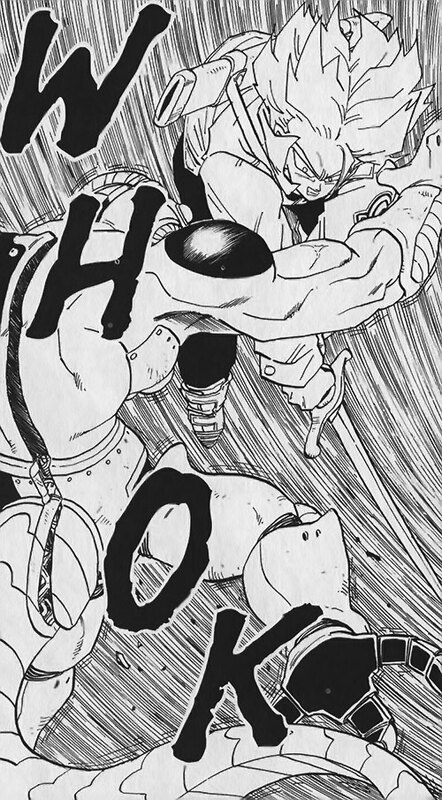 Trunks decided to interfere in his father’s personal battle with Android 18, shattering his sword on her impenetrable form. But ultimately he had little affect on the outcome of the battle. Before he knew it, the android trio had rendered all but one of the Z fighters helpless or unconscious before they grew bored and left in a stolen vehicle. When his allies recovered, Trunks could only watch as his father flew off in a pride fuelled rage in the search for solitude. He then watched as Piccolo flew off to Kami’s outlook after declaring his intention to fuse with Kami and increase his power to levels great enough to destroy the evil androids. Before he could decide what to do, he (along with Krillin and young Son Gohan) received a message from his mother Bulma. She had found a replica of Trunks time machine, and a strange shell-like exoskeleton within it. Curious and fearful at what this meant, Trunks flew skyward with Son Gohan to discover the origins of the alternate time machine. When Trunks arrived, he confirmed the pedigree of the time machine and they realized that someone or something else had also returned from the future. As the other Z Fighters discovered the truth behind the alternate time machine, Trunks joined his father on a rocky outcropping on the side of a mountain. He waited for three full days in silence, watching as his father stared silently into space. The silence was eventually broken when a recovered Goku appeared out of thin air and gave them the key to beating the significantly more powerful androids. He gave them the key to the Hyperbolic Time Chamber; a room within which the passage of time was greatly accelerated and would allow them to achieve a year’s worth of training within a single day. Initially Vegeta wanted to enter the Chamber on his own, but he eventually agreed to train alongside Trunks as he recognized the need for a sparring partner. Trunks, excited at the prospect of spending a year alone with his father, agreed readily and entered the Chamber along with Vegeta. The two spent the year completely isolated, and pushed their bodies to the absolute limit each and every day. It didn’t take long for Vegeta to exceed his limits as a Super Saiyan, but his progression halted just as rapidly. Trunks however, was able to push even further pass his limits and discovered a well of strength deep within himself. But in doing so, he also recognized that to show his full strength would further damage his father’s already fragile pride. With that in mind, Trunks hid his true strength from his father in order to maintain his fragile yet evolving relationship with the prideful Saiyan prince. A year later, father and son emerged from the Chamber, ready and eager to face their android opponents. When they emerged, Trunks was astonished to discover exactly how powerful Cell had become and that the creature had already absorbed one of the androids. Moments later, both he and Vegeta rocketed skyward to face their new foe. They found Cell on a seemingly desert island off of the shore of Japan, locked in combat with Piccolo. Even as they touched down, Cell defeated the aggressive Namekian with a flourish of power. Cell greeted the Saiyan duo with derision in his voice and actually gave them a chance to escape. Neither Trunks or Vegeta could be baited by Cell, with their heightened senses they could immediately tell that the enigmatic android was absolutely no match for either one of them. Trunks waited in silence when his father eventually attacked Cell and overwhelmed the android with his “Ascended” Super Saiyan might. For the first time in over a decade, Trunks began to relax as everything seemed well in hand, until his father’s pride ruined everything. Cell, desperate and wanting nothing else but to be powerful, manipulated Vegeta into allowing him to merge with Android 18. To Trunks dawning horror, Vegeta was unable to resist the challenge and allowed Cell to merge with Android 18. 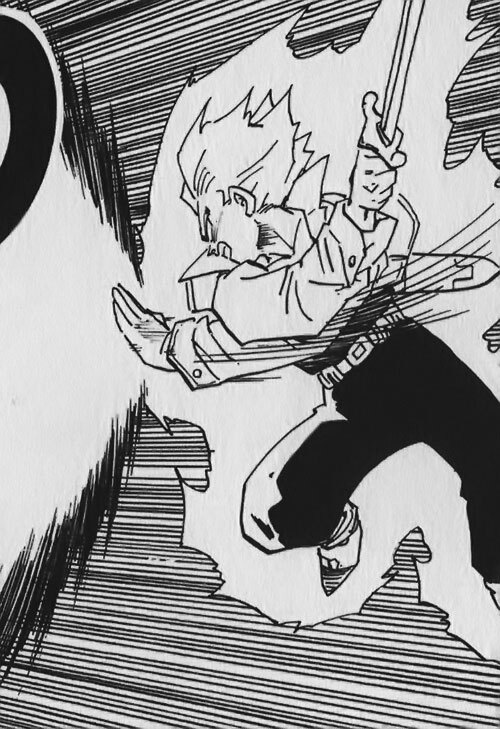 Trunks, recognizing the danger at hand, moved to destroy both Cell and Android 18 but was sucker punched by Vegeta before he could. Even as Trunks watched, Cell incorporated Android 18 into his form (against her will) and underwent an incredible transformation. His power was increased exponentially, and in moments he became several magnitudes more powerful than Vegeta. With that the two warriors renewed their conflict. Trunks watched their battle, alongside Krillin (one of the other Z Fighters) and refused to interfere. He knew that his father would never forgive him for interrupting his battle, and he would not risk losing the fragile relationship he had forged with the father he never knew. He watched stoically as with every savage blow, Cell destroyed Vegeta’s body and renewed ego, until Vegeta was eventually rendered unconscious. As soon as his father fell, Trunks entered the battle against Cell and valiantly tried to hold his attention while Krillin escaped with Vegeta’s unconscious form. Cell, realizing what Trunks was doing, simply stopped fighting and asked Trunks to fight him with his full strength. Trunks, feeling somewhat sheepish and angry beyond belief, finally stopped holding back. He tapped into that well of power within himself and exploded with power. His muscles swelled to enormous proportion and his physical strength multiplied exponentially. Cell watched his transformation with some interest and then with a calm smile, attacked Trunks. Cold anger filled Trunks heart as he attacked the enigmatic android, but despite his increased power it became abundantly apparent that he could not win the battle. His increased musculature came at cost of his superhuman speed, and without it he simply could not make contact with the awesome android. To make matters worse, he understood in that instant that his father could have reached this level of power, but had realized its weakness earlier on. Deflated and defeated, Trunks powered down and waited for Cell to finish him off. Cell, however, had a different plan. Instead of killing Trunks, he questioned him on whether or not he could get even stronger if given more time to train. A glimmer of hope blossomed within Trunks, and he responded defiantly “yes” and that Goku would be even stronger than he would become. Cell’s irrational need to defeat only the strongest of foes pushed him to give Trunks the chance. He proposed that he would hold a tournament in ten days time, giving Trunks and his allies some time to recover and to increase their already impressive strength. If they didn’t take part in the tournament, Cell would destroy Earth in retaliation. For Trunks, the next ten days were filled with nothing but intense training. He spent another year within the Hyperbolic Time Chamber and emerged even more powerful than before but even as he stepped out of the chamber, he realized that his power was still dwarfed by the awesome android. Despite this, the allied warriors refused to surrender, and upon the tenth day, came to the grounds of the “Cell Games” ready to fight to the end. Trunks was ready to throw himself into the fray when Cell asked for a volunteer to face him first, but like all of the other Z Fighters, was shocked when Goku stepped forward first. Trunks questioned the decision for their strongest warrior to fight first, but could only root for Goku to win as the battle started. The battle was fierce yet short, and ended when Goku surrendered rather than continue the fight. In his stead, he nominated Son Gohan to fight the powerful android. Gohan reluctantly agreed and stepped into the arena to face the murderous android. Despite his fierce countenance, Gohan still held back and was unwilling to unleash his full fury against the android. Trunks realized that unlike all of the others, Gohan was still a child and didn’t truly enjoy fighting. Cell eventually grew impatient with the boy, and in an effort to force Gohan to fight back, sent several miniature clones of himself to assault Trunks and the other fighters. Trunks fought the miniature version of Cell to the best of his ability, but slowly lost ground. As he and the other fighters fell, Gohan’s anger continued to grow until enraged, he finally burst through his limits and achieved the Super Saiyan 2 state. Gohan, with his awakened power, destroyed the Cell clones literally within seconds. Trunks’ eyes widened as Gohan then turned his attention on Cell himself, and battered the machine mercilessly. Even as hope bloomed within Trunks and the others, Gohan took too much time to gloat and inflict even more pain on the android. This gave Cell enough time to trigger his self destruct failsafe. Before it exploded, Son Goku sacrificed his life to teleport the android far enough away to save the Earth. Trunks stood in shock at the turn of events, and like the others was processing the loss of their friend when a bolt of energy raked across the field in which they stood and tore straight through his chest. He didn’t even have a chance to scream or protest his fate, as the blackness of death finally claimed him. Trunks next awoke on the grounds of Kami’s Lookout, high above the Earth’s surface. He had been revived by his allies through the use of the mystical artifacts, the Dragonballs. His allies piled affection and praise upon Trunks as he awaken from the dead, and told him the final sequence of events that occurred after he had been killed. Cell had returned, more powerful than ever, but Gohan eventually defeated him due to a timely distraction by his father Vegeta. Trunks heart swelled with emotion, as the others regailed him with the tale of how his father became absolutely enraged at his death and unleashed a rage filled flurry of energy at Cell in response. It seems that during their time together, the stoic Saiyan Prince had come to truly care for his son. Trunks stayed and celebrated with his friends for some time until his time machine had regained enough of a charge to return him to the future. Even as he said his good-byes, he noticed his father standing a distance away from the others in the shadows with an odd look upon his face. The two shared a secret smile, and Vegeta raised two fingers in a salute to his son before turning and leaving. Pride filled Trunks’ heart at his father’s gesture, and with that he entered his time capsule and returned to his present. He spent a few joyous moments reunited with his mother, and then set out immediately to find the two androids that had destroyed his life. He found them in short order, and without pause or fear attacked them on his own. The androids were surprised at Trunks’ appearance or sudden confidence. To them, he was still the same weak kid that they had beaten only a few short days prior. The couldn’t be more wrong. Trunks training with his father, his experiences in battle and his unadulterated rage at the androids atrocities had forged him into the most powerful warrior of his time. The two androids stood zero chance against him. In two short blasts of super-powerful chi, Trunks reduced the once formidable androids to burning cinders and freed his present from their threat. Unscathed, Trunks return to his home and waited for what he knew was coming. He had had time to process the events in the past and realized what had happened. Sometime in his immediate future, Cell would be born and would come looking for the androids that he had just destroyed. When he didn’t find them, he would murder Trunks and take the time capsule into the past and menace the Z fighters. At least, that is what happened in a splinter timeline previously… but in Trunks timeline, the future was not yet set. Cell reared his head three years after Trunks destroyed Androids 17 and 18, searching for his means to perfection. He fully expected to take Trunks by surprise, and was fully taken aback when Trunks greeted him by name and told him that the androids he was searching for were destroyed years prior. Fully confident in his own abilities, Cell attacked Trunks with the intention of taking his time capsule, but is completely overwhelmed by Trunks’ mature strength. In fact, Trunks first blow of the battle hit Cell so hard, it sent him hurling out of the city they were fighting in and all the way into the countryside away from bystanders. The enigmatic android did its best to destroy the young Saiyan, but ultimately fell short. 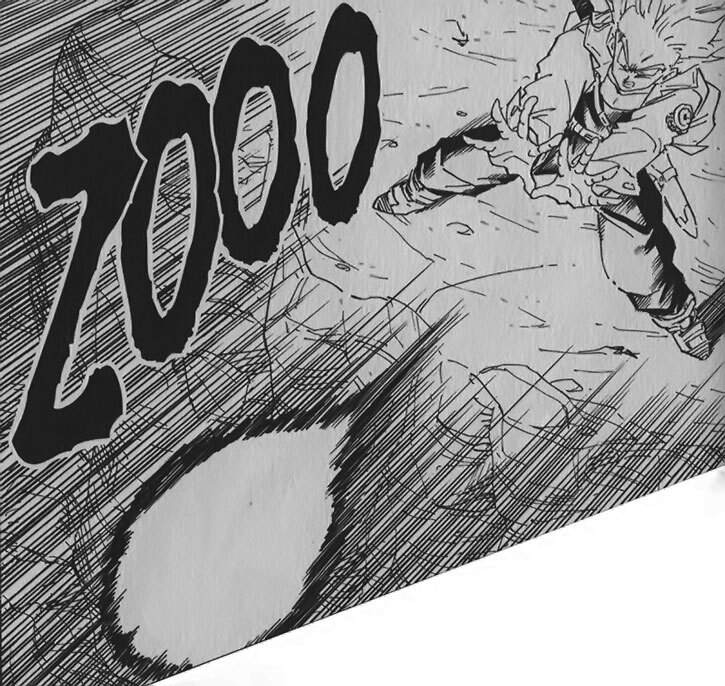 Trunks powered up a full force blast of chi and incinerated Cell down to an atomic level. With that Trunks had finally secured the fate of the planet Earth and its people. He had succeeded in his mission to free his people from the threat of the androids, and after sending a thankful prayer to those who helped him along the way, settled back to finally enjoy the peace. 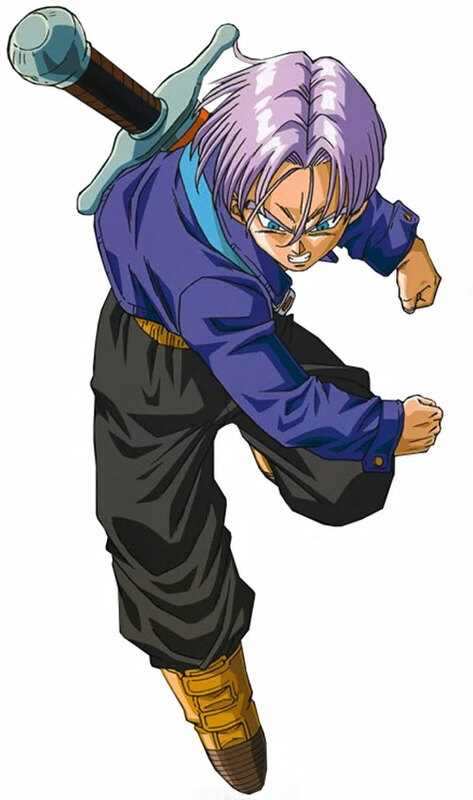 Trunks appears to be a young Japanese man, of average height with a lean, well muscled build. 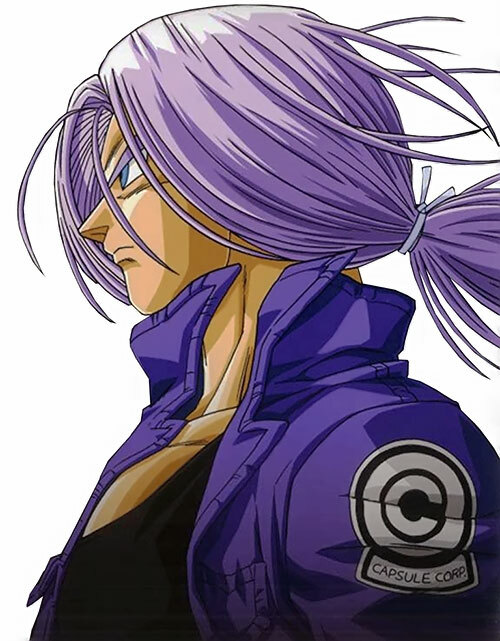 Unlike the majority of his race, Trunks’ shoulder length hair is a bright lavender colour and bright blue eyes. His face greatly resembles his father; his features are very lean and sharp, yet remain noble and some would say handsome. Throughout the majority of his appearances, his usually seen wearing golden brown boots, gray slacks, a black tank top, and an dark blue Capsule Corporation bolero jacket that has a prominent Capsule Corps logo on his right shoulder. He also wore the bandolier for his sword over top of his jacket, with the sword and its sheathe hanging across his back and over his right shoulder. After training with Vegeta, Trunks took to wearing the typical battle armor of the Saiyan warriors. It consisted of a blue skin-tight jumpsuit, white gloves, white boots with golden brown tips, and a white and golden brown chest plate. When Trunks assumes the Super Saiyan state, his physical appearance alters immensely. His long hair stands straight up, and turns a vibrant gold colour. His eyes remain blue, and a pulsing, golden flame-like aura surrounds his body from head to toe. In this state, his muscles swell with power and he actually becomes physically larger and even more defined. By tapping fully into his excess reserves, he can become even larger by packing an unknown number pounds of pure muscle onto his frame, giving him an almost Hulk-like appearance. Trunks is a quiet, restrained and patient individual who has but a single concern; protecting his present from the androids that have caused him and his people so much agony. Trunks will go to any length to accomplish this goal, save sacrificing those he loves. He is a reasonable, tactical thinker who in the end, doesn’t truly fit in well with the other Z Fighters. It is his rationale nature (instilled in him by both Bulma and Gohan) that makes him stand apart from warriors like Son Goku or Vegeta. If Trunks needs to attack his enemy from behind to succeed, he’ll do it. If Trunks needs to cheat to win, he’ll do it. He’s not concerned about honor or glory in battle, he is only concerned with the results. Despite this, Trunks is still a teenager and can be driven to rash or foolhardy action by his immature instincts and youthful overconfidence. Trunks deeply loves his mother, and for the majority of his appearance was curious about his father. Over their time together, he desperately wanted to gain Vegeta’s approval, and in the end when he did so finally felt as if he earned his father’s affection. Trunks also feels very strongly about Son Gohan, who raised him and taught him to fight in the future. The Saiyans could have been a race of distantly related cousins to Kryptonians or Daxamites, or simply the inhabitants of another planet in the vast DC Universe. Insert Superman into Goku’s place, and Vegeta has another foe to obsess over and continually attempt to defeat. Detect has Range Bonus, is Discerning (+1FC), can reveal overall strength of target (i.e. average AP level, general HP level, current BOD, etc) (+2FC), and is a Skilled Power (+1FC). Obscure is a Skilled Power (+1FC). Superspeed can’t be used to shorten time taken for tasks (-1FC). Alter Ego (Super Saiyan), Astounding Potential, Language (Japanese), Lightning Reflexes, Scholar (Androids, Capsule Corp Technology, Electronics), Slowed Aging, Rich Friend (Bulma). Vegeta (High), Son Goku (High), Bulma (High), Son Gohan (High). SAIYAJIN’S ARMOR [/BODY/ 12. Bonuses & Limitations : Partial Armor: can be bypassed with a successful +1cs Trick Shot, Misc: armor can stretch to accept users with up to Growth: 10 and Stretching: 10 (10 pts)]. Sword [BODY 12, EV 04 (13 with STR), Sharpness (EV): 01, R#0]. Time Machine [BOD 06, Time Travel: 25, R#01]. When Trunks enters his Super Saiyan state, his physical stats and powers of Energy Blast, Reflection/Deflection, Super Speed and Flight are all increased by +5 APs. He also gains the Flash power at 1 AP along with the Density Increase Power at 5APs with the Bonuses & Limitations: Flash is Always On, and can produce Steady Illumination Only; Density Increase has the advantage that APs of active Density Increase add to STR (+2FC) and subtract from DEX (-1FC). In addition, he also gains the Increased Reserves Schtick and the Strange Appearance drawback while the state is active. Source of Character: Shōnen Manga Series – Dragon Ball, created by Akira Toriyama (author & illustrator). Writeup completed on the 17th of February. Dragon Ball Z, Vol. 5 (VIZBIG Edition): Dr. Gero’s Laboratory of Terror!